Another "ghost ship", suspected to be from North Korea, has washed ashore in Japan. The boat contained the remains of seven men, and a North Korean propaganda pin. 2017 saw the most ghost ships to arrive in Japan since data collection began. A boat that washed ashore in Japan this month appears to be another North Korean ghost ship. 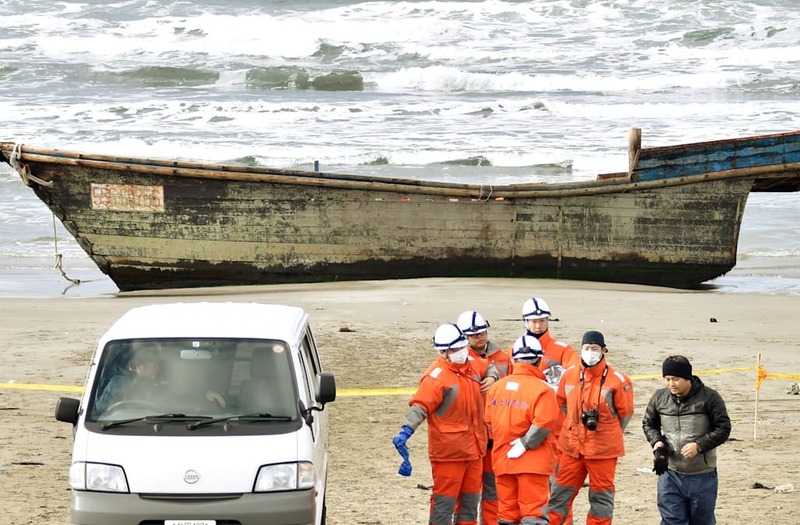 The capsized boat, that had seven bodies on board, washed ashore in the Ishikawa Prefecture, east of Tokyo, last Wednesday. Police announced on Tuesday it had found decayed remains of seven men inside small rooms, according to Kyodo News. The Bay of Wonsan is seen from a hotel room in this October, 2016 photo in Wonsan, North Korea. To match Special Report NORTHKOREA-TOURISM/WONSAN Christian Petersen-Clausen/Handout via REUTERS ATTENTION EDITORS - THIS IMAGE WAS PROVIDED BY A THIRD PARTY. Portraits of former leaders Kim Il Sung and Kim Jong Il are seen in central Wonsan, North Korea October 2016. To match Special Report NORTHKOREA-TOURISM/WONSAN Christian Petersen-Clausen/Handout via REUTERS ATTENTION EDITORS - THIS IMAGE WAS PROVIDED BY A THIRD PARTY. Artists of the Moranbong Band, the State Merited Chorus and the Wangjaesan Art Troupe, perform in Wonsan City of Kangwon Province, North Korea in this undated photo released by North Korea's Korean Central News Agency (KCNA) on September 14, 2017. To match Special Report NORTHKOREA-TOURISM/WONSAN KCNA/via REUTERS ATTENTION EDITORS - THIS PICTURE WAS PROVIDED BY A THIRD PARTY. NO THIRD PARTY SALES. SOUTH KOREA OUT. NO COMMERCIAL OR EDITORIAL SALES IN SOUTH KOREA. The Mangyongbong 92 ferry is seen docked in central Wonsan, North Korea, October 2016. The ferry used to carry goods and people between North Korean and Japan until Tokyo introduced unilateral sanctions banning the trips. To match Special Report NORTHKOREA-TOURISM/WONSAN Christian Petersen-Clausen/Handout via REUTERS ATTENTION EDITORS - THIS IMAGE WAS PROVIDED BY A THIRD PARTY. Statues of former leaders Kim Il Sung and Kim Jong Il are seen in Wonsan, North Korea October 2016. To match Special Report NORTHKOREA-TOURISM/WONSAN Christian Petersen-Clausen/Handout via REUTERS ATTENTION EDITORS - THIS IMAGE WAS PROVIDED BY A THIRD PARTY. A girl carrying goods cycles past wild flowers near the North Korean town of Wonsan October, 2016. To match Special Report NORTHKOREA-TOURISM/WONSAN Christian Petersen-Clausen/Handout via REUTERS ATTENTION EDITORS - THIS IMAGE WAS PROVIDED BY A THIRD PARTY. The centre of Wonsan, North Korea, is seen from a hotel window October, 2016. To match Special Report NORTHKOREA-TOURISM/WONSAN Christian Petersen-Clausen/Handout via REUTERS ATTENTION EDITORS - THIS IMAGE WAS PROVIDED BY A THIRD PARTY. North Korean leader Kim Jong Un provides field guidance to the Wonsan Baby Home and Orphanage in the run-up to a ceremony for their completion, in this undated photo released by North Korea's Korean Central News Agency (KCNA) June 2, 2015. REUTERS/KCNA ATTENTION EDITORS - THIS PICTURE WAS PROVIDED BY A THIRD PARTY. REUTERS IS UNABLE TO INDEPENDENTLY VERIFY THE AUTHENTICITY, CONTENT, LOCATION OR DATE OF THIS IMAGE. FOR EDITORIAL USE ONLY. NOT FOR SALE FOR MARKETING OR ADVERTISING CAMPAIGNS. NO THIRD PARTY SALES. NOT FOR USE BY REUTERS THIRD PARTY DISTRIBUTORS. SOUTH KOREA OUT. NO COMMERCIAL OR EDITORIAL SALES IN SOUTH KOREA. THIS PICTURE IS DISTRIBUTED EXACTLY AS RECEIVED BY REUTERS, AS A SERVICE TO CLIENTS. People attend the Wonsan Air Festival 2016 in Wonsan, in this undated photo released by North Korea's Korean Central News Agency (KCNA) in Pyongyang on September 26, 2016. KCNA/Handout via Reuters ATTENTION EDITORS - THIS PICTURE WAS PROVIDED BY A THIRD PARTY. REUTERS IS UNABLE TO INDEPENDENTLY VERIFY THE AUTHENTICITY, CONTENT, LOCATION OR DATE OF THIS IMAGE. FOR EDITORIAL USE ONLY. NOT FOR USE BY REUTERS THIRD PARTY DISTRIBUTORS. SOUTH KOREA OUT. THIS PICTURE IS DISTRIBUTED EXACTLY AS RECEIVED BY REUTERS, AS A SERVICE TO CLIENTS. North Korean leader Kim Jong Un (C) applauds during a photo session with the soldier-builders who performed labor feats in building the Wonsan Baby Home and Orphanage in this undated photo released by North Korea's Korean Central News Agency (KCNA) in Pyongyang June 3, 2015. REUTERS/KCNA ATTENTION EDITORS - THIS PICTURE WAS PROVIDED BY A THIRD PARTY. REUTERS IS UNABLE TO INDEPENDENTLY VERIFY THE AUTHENTICITY, CONTENT, LOCATION OR DATE OF THIS IMAGE. FOR EDITORIAL USE ONLY. NOT FOR SALE FOR MARKETING OR ADVERTISING CAMPAIGNS. THIS PICTURE IS DISTRIBUTED EXACTLY AS RECEIVED BY REUTERS, AS A SERVICE TO CLIENTS. NO THIRD PARTY SALES. SOUTH KOREA OUT. NO COMMERCIAL OR EDITORIAL SALES IN SOUTH KOREA. A badge portraying former North Korean leaders Kim Il Sung and Kim Jong Il was also found on the boat. In 2017, 104 ghost ships washed ashore in Japan, the most since data began being collected in 2013. Many of the ships have bodies on board. Japan is struggling to deal with the remains of North Korean fisherman, as the two countries don't have diplomatic relations. The reason for the large spike in North Korean fishing boats arriving in Japan is unknown, but experts have told Business Insider it could indicate a food shortage in the country.